Braxton Chong set his first state record when he was 5 years old (a white crab) and now has his second at age 14. He was throw-netting at Sandy Beach in the evening and thought he'd caught a moana. To his surprise, it was the biggest squirrelfish he ever seen--at least three times bigger than anything he'd ever caught on his bamboo pole. 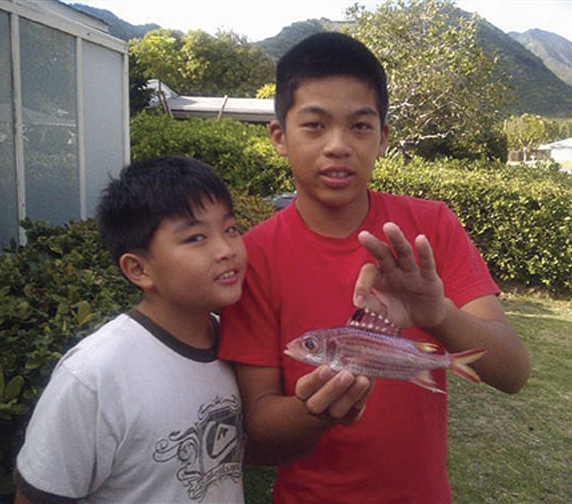 Logan Chong, his younger brother, is Braxton's inseparable fishing buddy.